Apcela has partnered with leading network analyst, Dr. Jim Metzler, founder and Vice President of Ashton, Metzler & Associates, to provide you with the complete 2018 Guide to WAN Architecture and Design. 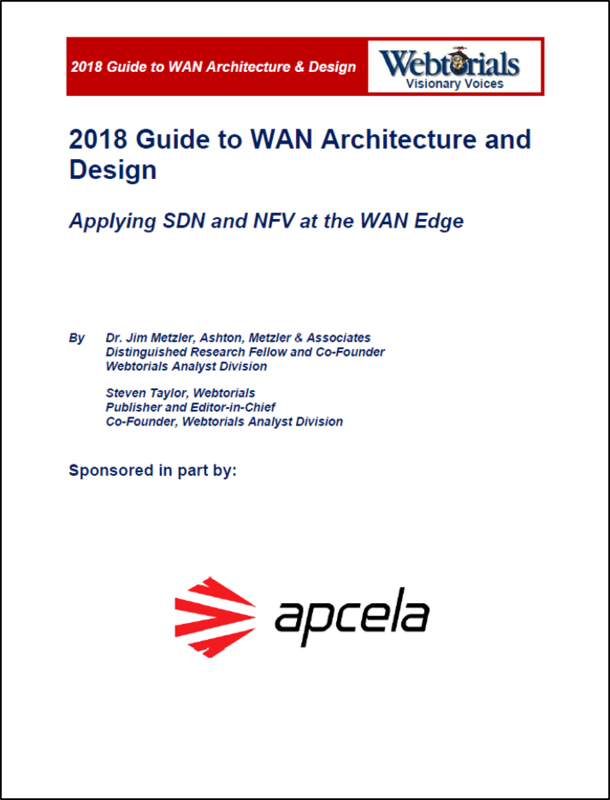 This comprehensive guide examines the state of WAN and architecture with an emphasis on current SD-WAN solutions, discusses important considerations relative to the overall process of WAN redesign, and provides valuable insight to where vendors like Apcela fit into today's SD-WAN ecosystem. The guide is made up of three parts, previously released separately but compiled in this complete guide. Learn about factors impacting the WAN, drivers and inhibitors of SD-WAN adoption, implementation of branch office virtualization, and more. Part two discusses important considerations relative to the overall process of WAN redesign. This chapter also includes considerations network organizations need to keep in mind as they evaluate alternative SD-WAN and SD-Branch solutions, to ensure they choose solutions that meet their current and future requirements. This final chapter aims to provide information about emerging solutions in the SDN and NFV fields to support all components of the WAN edge. Part 3 also discusses an ecosystem of vendors who supply SD-WAN and/or SD-Branch solutions with in-depth profiles to help organizations make the best choice for their networking needs. To access this valuable resource, fill out the form today!